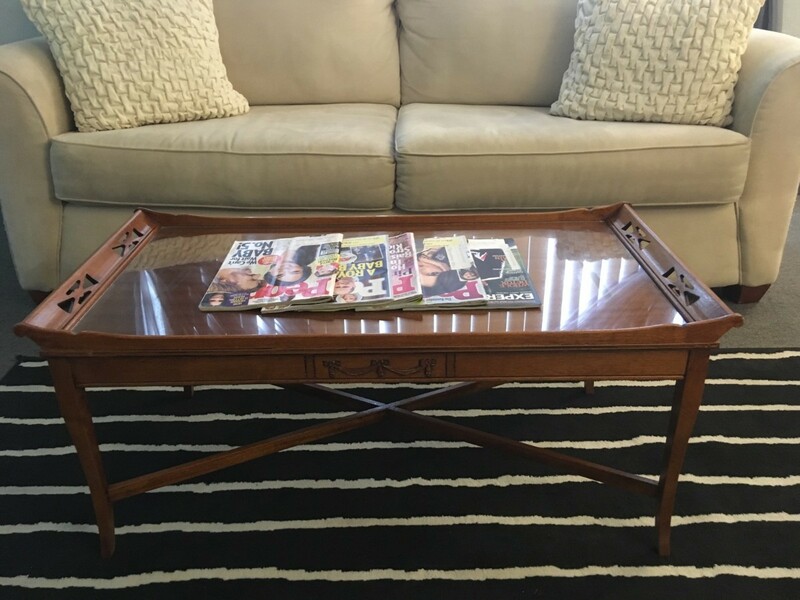 I would like to know if you have any information about this style and design of table. It was in my attic wrapped in newspaper and the newspaper date was 1967. It's all wood with a glass top. If you have any information about this table please email me back. It's an interesting piece. If I were playing detective based on being wrapped in 1967 newspaper, I would think it was probably an older piece some one was tired of...so subtract 20 years or so and I would say it is a 1940s piece, pre mid century modern because true mcm would not have the gingerbread sides, but it has clean lines on the sides. Or if it was a hoarder who had 1967 paper laying around last year it could be new? But again I doubt that theory! The Monk or Columbo in me would have an antique dealer look at it and see if they can you any history and a value if you don't find any markings. Technically if it is 1940s it is not an antique, but the store owner is still a great resource! If you find markings on the underside, please post them and I can help you value it. Without more info it is hard to set a value. Neat item! Thanks for sharing! Without a name or marking it would be very difficult for a lay person to place a value on vintage/antique furniture as we have nothing to compare it with. You may search everywhere for a very long time and probably never see an identical table. Even if a similar table were found it would not mean the value would be the same. 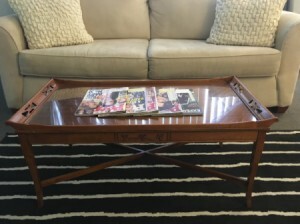 Your table is a coffee table and looks to be in very good condition which means a lot when it comes to value and especially the value of an antique or vintage piece. If you cannot find any name or markings on your table I would suggest you ask for an appraisal as they may be able to date it and even supply a maker's name. Here is a site that has several listings for free appraisals so if you are really interested you can ask for information from several. You will need several good pictures showing all details of the piece as well as measurements. Ask for a retail value. This information you receive will be well worth your time.